I spend way too much time shopping for things on Craigslist. Buying used can be a great deal or you could just be buying someone else’s headache. You need to research and understand what you’re buying. Specifically around printers, vendors have good models and models that are not so good. Doing a web search on the issues around a certain model will lead you to find what kind of problems people are having and if there is any consistency around them. I also look to buy printers from the same family so that they use the same toner cartridges to save money that way, as well. I started watching on Craigslist, I found a trend that some of these better departmental size printers pop up on Craigslist often. I think people buy them for home businesses and realize maybe they’re too big or in many cases they end up with one from a small business that didn’t make it. I found a CM1415fnw that someone was trying to sell. 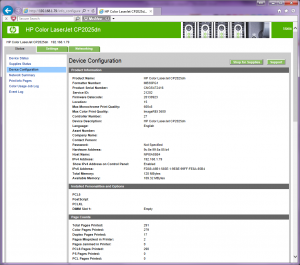 HP printers make it easy to get information, as there are several reports that can be printed from the printer at a push of a button, showing you toner capacity and total pages printed. The CM1415fnw I was dealing on had roughly half the toner left in all four cartridges. Initially the price was fairly high on the printer and I continued to research it. The known issues or problems with the printer seemed to be driver related and easy to resolve. One day I got an e-mail from the seller. He was motivated to sell and had dropped the price from $250 to $75. I jumped on the opportunity. Meeting the seller in person, he told me the printer had belonged to a small business where his mother was the secretary and when the business folded they let her take the printer home. I brought the printer home. It was in excellent condition. I added the printer to my network, configured it, updated the firmware and ran the maintenance apps to clean the printer. 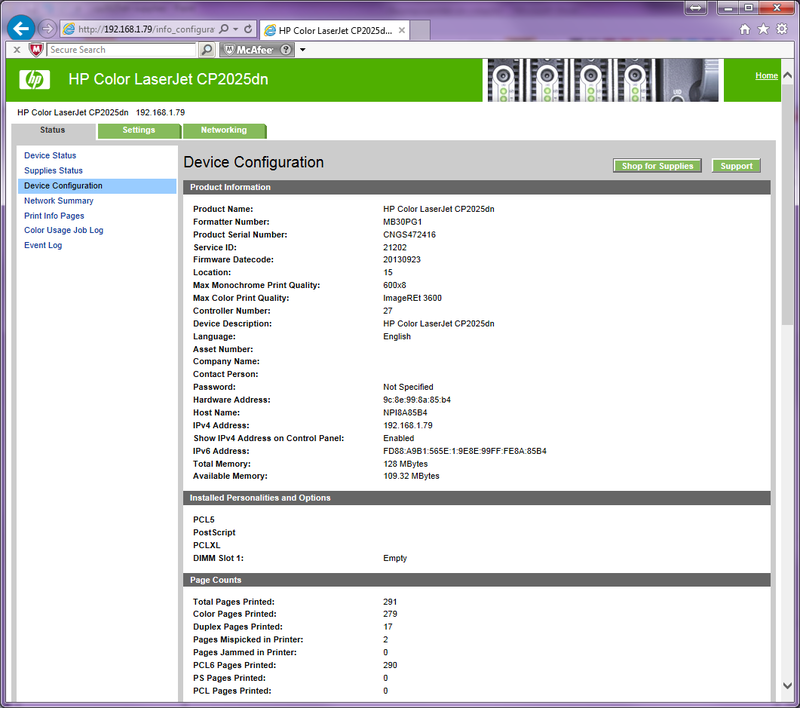 Printing and scanning functions worked perfectly and HP’s tools make using the printer extremely easy. Researching the CP2025 I found that many of the early units had an issue with black stripes in the print which actually is linked to a motor failure. Later models seem to not have this issue. 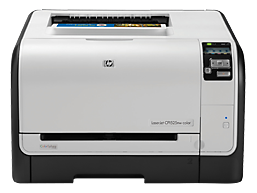 The CP2025 is a departmental size color laser printer and some versions include full duplex printing. Now that I had a better idea of the issues around the printer I followed up on an ad. The couple was selling the printer because they were moving to a smaller apartment. I asked them to verify the model number and they e-mailed me a picture of the back of the unit. Quickly doing a web search I was able to find that it was CP2025dn which is the model that includes networking and duplex printing. The info also showed me this printer was manufactured in late 2011, which would make it a later model version and should not have the issues with the motor. 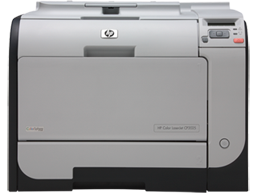 The only features missing from the CP2025dn are wireless networking and the HP E-print feature. Otherwise it’s rock solid workhorse printer. 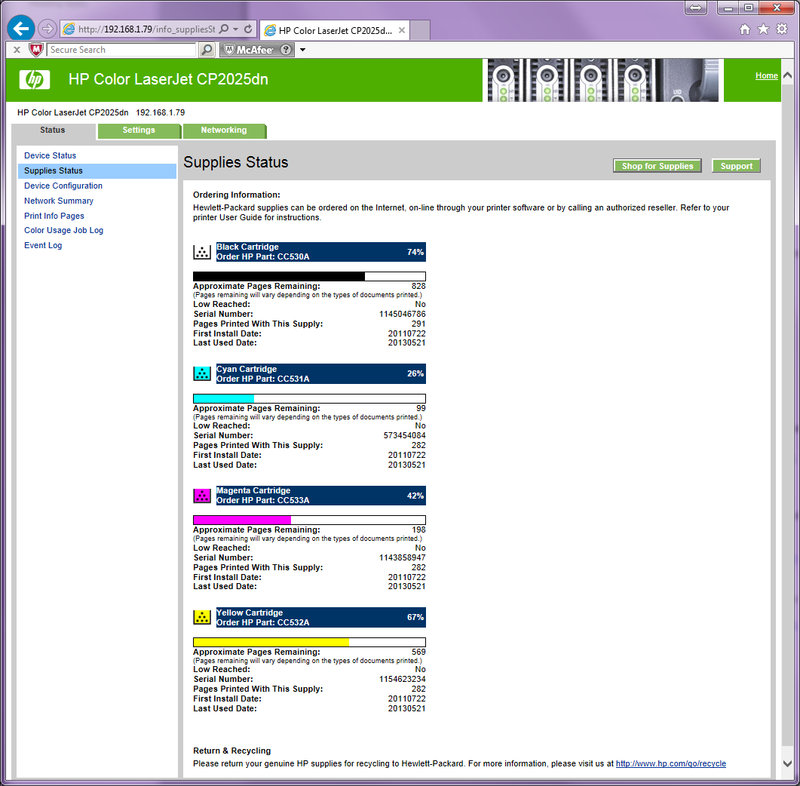 I also asked them to print out the configuration page and the supplies page which she e-mailed to me. Much to my surprise the printer had two thirds of the black cartridge and half of each color cartridge still available. Page count showed that the printer had only printed 270 pages. They were asking $100 for the printer. With this much toner left and the low over all print count, $100 seemed like great deal. I got the printer home and it was in perfect condition. I installed it on my network, updated the firmware and it has printed perfectly since. I use several craigslist apps to help me search for products and technologies. In this case, by doing a search on the CP2025 I found several to choose from. 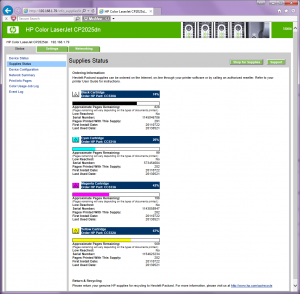 Additionally, searches brought up an ad where someone was selling third-party toner cartridges for the CP2025. They had all three color cartridges and two black cartridges, that would be five cartridges for $120. I have a bit of a concern buying third-party toner unless I use the brand before this happened to be from a company called LD which I have used and have had good luck with. So now for little more than $220 I have a nearly new departmental color laser printer, a whole new set of toner cartridges and I’m a happy guy. One point of disclosure, the county I live in offers free recycling for computer equipment so in case I ever get stuck with a bad laser printer it will cost me nothing to get rid of it. The other thing about shopping locally on craigslist is no shipping charges and sometimes if you meet the person to pick the item up you can get them drop a little bit more off the price. Do your research and know what model it is you want to buy. Check the product history for known issues or commonly found problems. Use apps to automate searches to find the product you’re looking for. As with any Craigslist deal if the seller is not responsive don’t waste your time. Specifically for printers in my case HP there’s a town of information that can be gathered from the printer itself and in the process of printing these reports yet she get to see if the print quality is good as well. 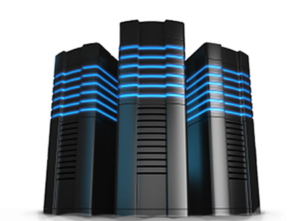 Configuration reports, a supply report and a demo page should give you enough information. As you’re in the process of searching for the printer don’t forget about searching for the toner as well. It’s up to you to determine what’s a good deal on a used printer. 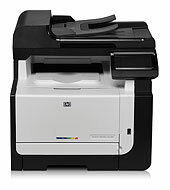 As toner is a huge expense in this equation, a good used printer with a lot of toner is worth much more than no toner. So what do you think, are these used printers good deals or not worth the time?